This author was inspired by Stuart Piggott's "Neolithic Cultures of the British Isles" and Donald A. Mackenzie's "Ancient Man in Britain", two excellent books focused on Britain's supposed past, from prehistoric to Roman times. Below is a summary of British history from my Main Industries chart which can be found in the section "Chronology of Neolithic Man - part two". As a prefatory note, I have decided to confine this study to showing how the exact chronology of Ussher compares to conventional historic dates starting from 3900-4000 BC (2295 BC Ussher). As you can see on the JPG Graph, linear correspondence does not extend beyond 2295 BC Ussher (3900-4000 BC Conventional). Regarding earlier Carbon-14 dates attributed to the biblical Flood and ancient ice ages that lie outside the JPG Graph coordinates, I have been advised that Young Earth Creationists have invalidated these dates for historical purposes. It should therefore be born in mind in this connection that a total of only 6000 conventional years is acknowledged by this author. This Author is a follower of Stuart Piggot's "Neolithic Cultures of the British Isles; and Mr Donald A Macenzie's "Ancient Man in Britain" which are two very exelent books focussed on Britain's supposed Pre-historic past to the Romans. This is a Sumary of British history from my main industries chart at my website http://www.johnhextfremlin.com. For the Main Industries chart please go to "Chronology of "Neolithic Man"" part two. 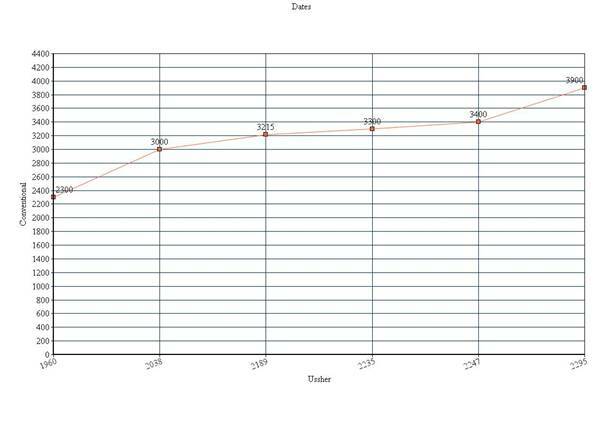 As a Preforatory note the auther has decided to confine himself to conventional dates showing the Ussher exact chronology match up startimg from 3900-4000 BC (2295 BC) as per linear JPG Graph which will not allow me to go any further than this as the top date 2295 BC lies on the straight line of co-ordinates of 3900-4000 BC. Please bear in mind in this connection that Flood Related Radio Carbon /14 dates such as 10,000 and 48,000 BC for supposed ancient ice ages for the Flood do not match up on the JPG Graph co-ordinates and I have been advised that YEC's have invalied these dates for historical purposes. Thus 48,000 BC=2349/2348 BC Flood Date. For those interested in reviewing my table also please click the icon Chronology of "Neolithic Man" Part two for the main chart. Thus it should be bourne in mind in this connection that the terms "Palaeolithic Man" "Neolithic Man" "Bronze age Man" Iron age Man &c mean little or nothing to this Author but the term "Neolithic Man" is an invention of my brother who is loathed to get rid of some of these evolutionary "Rubber Goal Post Terms" who very kindly helped me set up my website. Of particular interest in this connection is the fact that some sites in Palastine date from 4000 BC according to conventional schollars which they call the Archaeological "Chalcolithic" a term which this author rejects and in itsplace Neolithic /Bronze/Iron and Steel. Thus in Summary then the terms Palaeolithic "Neolithic" "Bronze/Iron and Steel are confined by this author to industries ownly and not ages and are usefull labels when dealing with historical sites and cultures. Thus these labels are the only labels here allowed by this author. Dear Bill I am delighted to say that my Re-evaluation Document and jpg linear correspondence is up and running and has been published on my website. To view document please click the icon "Re-evaluation of Ancient Man in Britain". I have printed and copied Donovan Courville's chart pertaining to the "Exodus Problem" which is on my website at http://www.johnhextfremlin.com/ and would like to point out that he Courville uses the "Thiel chronology" for his conventional 10,000 BC=2300 BC as far as the Pre-dynastic period in Egypt is concerned and thus as a result he is way off by 47 Years which added to 2300=2347 BC on the Ussher chronology. The book of Genesis insists as do I that from 2347 to 2189/2188 BC as far as Egypt is concerned is what archaeologists call Pre-dynastic thus the matching conventional date needs to be 10,000 BC=2347 BC by adding 47 Years to the Thiel chronology thus 2300+47=2347 BC in Ussher's correct chronology which would cover the whole period (as well as the first world survey teams 2295 BC] up to and including 2189/2188 BC (Founding of Egypt by Misraem which is the first dynasty) so I need to stress that Iam very thourough with my Ussher chronology and leave no stone "unturned. However as far as the chronology document and jpg linear correspondence goes very kindly sent to me by Mike Fischer I cannot go beyond 2295 BC as the linear correspondence will not let me exeed that date, accept to mention the conventional 10,000 BC dating in the text ownly but most definitely not in the chart to match2347 BC. The chap who did have expertise in this field is now no longer with us. But he did use to refer to Barry Setterfield's work on the speed of light. Setterfield found that if you extrapolated backwards the decay of the speed of light, then at about 4000 BC the exponential curve goes off the scale. In other words, the speed of light was infinite at the Creation. The speed of light profoundly affects the decay rate of C14. I have no references for you right now (I'm in the middle of researching Joshua), but Google Barry Setterfield (Australian) and you will find references to follow up. Hope this helps. "They were presumably a branch of the primitive small-statured, narrow-browed and long-headed dark race of matriarchist Serpent-worshipping cave-dwellers... who, in early prehistoric times in the Old Stone Age, sent off from this central hive swarm after swarm of "hunger-marchers" under matriarchs, westwards across Asia Minor to Europe, as far as Iberia and the Biscay region, after the retreating ice. The hordes, which ultimately reached Albion overland, formed there the "aborigines" of Albion. They appear to have entered Southern Albion by the old land-bridge at Kent, after the latter end of the last glacial period, when the reindeer, mammoth and woolly rhinoceros still roamed over what is now called England. And then, long ages afterwards, in the late Stone Age, presumably before 2000 B.C., they gave off a branch to Erin under a Van, Ban or Fian matriarch, forming the aborigines of Ireland. I wonder two things. First, are there today, perhaps in northern Britain, people who display dark skin, short stature, long heads, and narrow brows? Second, if there was a Phoenician heritage, would not they have tended to travel by sea rather than march overland to Europe and cross a land-bridge to Britain? There does not appear to have been a nautical tradition among the Picts. The complete disappearance of the Picts around 850 A.D. is not even in the deep mist of the past, yet it is a mystery in itself. How much greater are the difficulties of your search into 1000 B.C., 2000 B.C, and beyond. For that I wish you good hunting. Dear Mike I have found a very interesting article on the Picts (Formorei) by Keith Hunt. According to Keith Hunt there were Ancient Phoenicians whom by his dating arrived in Britain about 2800 BC (Would this be about 2082 BC for the arrival of Albion?) I suspect so. It seems that the Phoenicians were in possession of the tin mines in Cornwall even at this early date. It's interesting that if so the Phoenicians used Bronze sparingly and made flint tools for the purpose of mining for metals and keeping the technology a closely guarded secret from the natives of this country. The popular definition of the Fomorians on Wikipedia is "In Irish mythology, the Fomoire (or Fomorians) are a semi-divine race said to have inhabited Ireland in ancient times. They may have once been believed to be the beings who preceded the gods, similar to the Greek Titans. They seem to represent the gods of chaos and wild nature, as opposed to the Tuatha Dé Danann who represent the gods of human civilization." The Encyclopedia Mythica entry at http://www.pantheon.org/articles/f/fomorians.html says "In Irish-Celtic mythology, the Fomorians are a race of demonic giants, ancient occupants of Ireland (or sometimes mentioned as a mythical, prehistoric people who raided and pillaged Ireland from the sea). The first to invade Ireland were the Partholons, but after many battles the Fomorians afflicted them all with plague. After them came the Nemeds, who in their very first battle were defeated and enslaved. The third wave of invaders, the Firbolgs, were more successful and they subdued the Fomorians and managed to live peacefully with them. After a period of peace, the Tuatha Dé Danann, the Irish race of gods, arrived. They conquered the Firbolgs, but dealt more subtly with the Fomorians, although they destroyed their hegemony over Ireland for good in the second battle of Mag Tuireadh. The Fomorians were given the province of Connacht, and were even allowed to marry some of the Tuatha Dé. The king of the Fomorians is the one-eyed Balor." From your investigations, how do these representations square with the truth? As you predicted several years back, the "official" view of Neanderthals has changed, and continues to change, in the direction of increased humanity. Their cultural level, technological ability, integration with "modern" humans, position in pre-history, and even their appearance are being upgraded. I agree that the history you developed shows Neanderthals to be extremely enterprising. Mainstream opinion is still a long way from seeing Neanderthals as Canaanites, but the door is more open now than before to evidence related to Neanderthals. Admittedly, it will take some work to show them as mariners. Regarding their height, 5' 4" does not seem to be particularly short for ancient people. It is clear Keith Hunt uses the conventional chronology. The value of his contribution would rest in the associations he finds among language and peoples rather than dates. In the end, evidence always beats convention. Dear Mike I have taken a brief look at chapter ten and Keith Hunt confirms that the picts or abouriginees of Britain and Ireland (though more specially Northern Scotland and Skara Brae 2189/2188 BC) were in fact the formors so if you click on to the previous chapter you will find I am correct. Thus it would have been impossible for Sessair to have arrived in Ireland shortly before the flood as everything was destroyed. More likely I suggest at the time of division in Peleg's day probably about 2247 BC to claim her fishing grounds I suggest in Ireland until when Cichol (the Footless which is to do with the serpent) arrived In Ireland in 2225 BC to commence hunting and gathering and fowling and fishing 200 years before battle of Magithe with Partholan in 2025 BC. Please note Mike Keith hunt is wrong about Partholan arriving in 400 BC because he arrived in Ireland in 2035 BC. These are the dates given me by Darrell . Let me answer your question at the end of the last paragraph first. 1/ I seem toremember emailing you on some question some years ago now on Neanderthal Man. 2/ Mike Fischer gave me the name of your book "The age of the Universe" and Mike and I were bothof us descussing radio carbon/14 dating in relation to and matching Ussher chronology post flood regarding the earliest world survey teams which I have evaluated. But it needs to be said however that (Yes I do accept the results of the "Rate Study") Flood related radio carbon/14 dating could be invalied by young earth creationists for historical purposes which is what I am primarily concerned with here. Creation historian Darrell White (and you might even know Dan Janzen as a case point of interest) has informed me that the Rate Study allows flood relatedradio carbon/14 daing to go back no further than 48000 BC. Thus Ussher's date for the flood 2349/2348 BC=48000 BC=50,000 before present. Now some yec's have tried to date the Neanderthals (Lu Paradise does not like the word "Neanderthal" but I think we need that label when examining archaeological sites as do most young earth creationists) from 4500 before present=2349/2348 BC which would accordingly give a false figure as the Neanderhtals came later suffice it to say that the Neolithic/Bronze/Iron and steel industries and farming came first before any hunter-gatherers like for example the Neanderthal and Cromagnon people groups. AD 410 The Roman Legions leave Britain as Rome is threatened by the Huns and Goths. When I attempt to find a date for ancient events I search for original durations, synchronisms, or other ancient clues - some ancient reference which allows me to estimate or determine a date. I never accept the speculation of modern chronologists as worthy of consideration unless they specify how (from ancient sources) they came up with their estimates. Obviously 500 to 700 BC is totally out of line and I am confident that author did not show how he came to that conclusion. 1) I think the best date for Brutus is 1118 BC. I know of only 3 or 4 credible ancient clues for the date. I assume the above is a rounded off number and could easily be as much as plus or minus 30 to 40 years off. Base on the more precise clues, a date between 1121 BC and 1118 BC is probably the best. I would choose 1118 BC, since it is the only precise duration given and fits well with the synchronism and generational estimates. Conclusion: Until further credible information is found, I would now suggest changing Brutus to arriving in 1118 BC. 2) My chart (after considerable thought) has the date for the Flood starting in Dec. of 2349 BC. FN Jones and Ussher both specify 2348 BC. My date is based on Hindu ancient records specifying the precise number of days from Creation and is likely to be more accurate than a duration based in years used by Jones and Ussher. However, we should use 2348 BC. Conclusion: I think it is best to keep it at 2348 BC as you have it. The difference is insignificant. Did the "Beaker Folk" come to Britain about 4500 years ago? Dear Bill the study on the Amesbury archer and the so-called "Bell Beaker" Culture is a very interesting one. Thus I have found from the Samothes kinglists that the archer overlaps the samothes coloney in 1960 BC (Conventional date 2300 BC) A News paper report in Focus magazine "proposes that the so-called "Bronze age" Beaker invasion displaced the late stone age farmers and expelledthem from Britain. That of course is a lot of absurd nonsense especially as we know that they were overlapping in the kinglists and were contemporary with the late "Neolithic " Samothes coloney in Britain and thus we find artifacts such as flint arrow heads and gold/copper and bronze in the same time period. However I do seriously submit that the Beaker People whom I have id'd as decendents or a remnent thereof of the people of Albion (2082 BC to 2038 BC) to the clash of the Titan although it would have been practically impossible for this Phoenician remnant to have made it through the Ice age melt down (1491 BC) I propose therefor that it was the decendents of Japeth or Gomer that came to Britain before Brutus in about 1365 BC who may have had the land confrontation with Brutus when he arrived in Totness in 1118 BC. Hi Darrell how is your Blueberry picking season doing? This is the first email for a long time that I am sending you as I have been very busy with my gardening work. Have you found any thing on the Amesbury archer who is dated by conventional archaeologists to 2300 BC and 1960 BC on the Ussher timeline. Mike Fischer alledges that according to a news paper article he sent me that the so-called "Bronze age" Beaker people displaced the Neolithic farmers which of course we instantly recognize as the Samothes coloney which is of course nonsense. I have said time and again that these people groups were contemporary with the samothes neolithic coloney. The news paper cutting alledghes that they came to Britain and invaded in 2500 BC by their conventional dating, Again surely this is nonsense as I sugest the so-called Beaker people were a remnant of Albion's coloney by our chronology 2082 BC to 2038 BC. The Amesbury archer reputedly came from Switzerland. Is there any solution to this mystery Darrell? It sounds like a question worthy of study, but at this time I do not know much about either the beaker people or the archer and it would require a lot of study. I do not expect to study this for some time since I will be travelling august 20-25. Once back I will start an intense study for 15 days. Hopefully I will be able to do some research on these items before November. Do you have a link to the newspaper article? Any link on how they came up with Switzerland for the archer? They must have documentation somewhere. BTW, we had a record blueberry harvest this year. Hi, John. Thank you for this. Please don't be too hasty in dismissing the possibility of Canaanites (Phoenicians) coming to Britain. They were being driven out of Canaan a full 100 years before your timeline of 1365 BC. I have attached my Authenticity of the Book of Judges, whose chapters 5 and 8 will be of interest to you. I'm not saying you are wrong in your thesis, far from it, but a Canaanite landing on these shores would not have been out of place at this time. Hope this helps. HOW AUTHENTIC IS THE BOOK OF JUDGES? Bill Cooper is a vice president and trustee of the Creation Science movement in the UK, and the author of many books. He has gathered some compelling evidence of the authenticity of these the book of Judges in the Old Testament of the Bible, attributed to the Hebrew prophet Samuel. Click on the link below to open a copy of his book, published here by permission of he author. I see all your emails, but just got back from an important meeting in Illinois and have a large backlog of things to get done before winter. Will try to respond when I can. 1) I am not taking time to search through my files to find information on conversions, but I checked my timeline chart and it suggested the unification of Egypt was in 2161 BC which secular chronology generally places at 3100 to 3000 BC. So my quick and very crude guess for 2800 BC would be about 2080 BC to 2040 BC. Note 1: The rate of increase in RC14 was rapid just after the flood so 200 to 300 RC years are likely only 80 to 120 actual years. Note 2: The accumulation of RC14 in the north might be less than that near Egypt. 2) Would the German colony have Bronze tools at the time they founded Trier. I would assume they would since whoever knew bronzework would have had to sell to the Assyrians. Would they know and have the technology to make their own? Maybe, maybe not. One or more of the sons of Japheth probably knew the technology and the sons of Sidon likely traded in it. More than that we would need arch. evidence for. However, you might check to see if the required minerals where available in the Trier region. check out this site: might add info. Could not find my notes, so I redid the study and found extra references. I have attached my open office word file which now contains 14 assertions of factual information and my thoughts on them. Have not see Afganistan Giant thing - send link if significant. Hi Darrell I have got your map. Interesting that the Bell/Beaker (Phenomenon) as some like to call it was based on a craze for a style in pottery types and not so much people groups or one people group with Bell/Beaker culture as it seems to have been addopted also by other indo european groups. Did the document I sent have the maps and pictures in them? If not, they can be found at the links I included or I can send them in an email. BTW: As I have mentioned, I have not been highly involved in Chronology for 7 years now. I still remember enough to be of general help, but I will not remember all the dates without looking them up - sorry for the mistake. Hi Darrell yes I have the maps you sent me and the precise area controlled by the canaanites (Sons of Sidon). Were then the sons of Sidon of Bell /Beaker culture. On the map I attached, the main region of BBC is the precise area that the sons of Sidon controlled and Hercules had to overthrow. Hi Darrell I have just looked up the date at which Samothes arrived in Britain according to the dating you gave me and the earliest date I have for Samothes is 2135 BC with Albion arriving in 2082 BC and expelled by Herculese in 2038 BC so 2138 BC would be too early for the Bell/Beaker phenomenon. Didn't quite figure out what you were saying? Hope I got it close. Made comments in brackets and Red within your Text - hope they have some meaning and help in some way. Glad you keep working on these things. I found the short research I did was fun and interesting. Learned a lot. Remember, I have done very little research in this area and the designation Neolithic means almost nothing to me (since I avoid said terms as invalid and misleading). 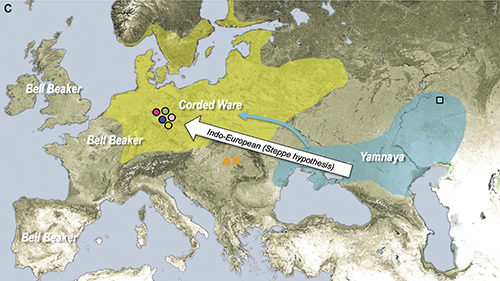 1) Supposedly, based on my limited reading, the corded ware culture established itself from N & NW Black Sea region to the Eastern Germany region just a short time before BBC arose (they date it 2900 to 2350 BCE). During the late BBC, BBC ware supposedly became adopted through central Europe as far as Bohemia. https://en.wikipedia.org/wiki/Corded_Ware_culture#Swedish-Norwegian_Battle_Axe_culture calls it the late Neolithic to Copper Age (which still does not mean anything to me). The Battle Axes it appears to have been made from out of stone - some look very heavy. 2) Samothes at 2135 BC would obviously be the very earliest BBC could have started. With the sparse population at that time, it seems unlikely it would represent a widespread culture. 3) Your suggestion of after Magus seems quite possible (and fits the larger population needed). When Samothes arrived, the sons of Sidon may not have been very friendly toward newcomers and would have been unlikely to arm these newcomers with Bows (which are likely a later development anyway). However, by Magus' death in 1960 BC, about 78 years after the defeat of Albion, they may have established more friendly relations and the Phoenicians may have established good trade relations. In that case the BBC culture would have had to lasted (100 to a few hundred years) from about 1960 BC to 1860 or to about 1700 BC (much larger populations by then-so better fit). However, we need some major disruption to end the culture - possibly the Famine at the time of Joseph might have impacted Europe (I've seen comment suggesting it affected the entire world). 4) So maybe 2 different time periods might fit much of the data - however, https://en.wikipedia.org/wiki/Beaker_culture suggest BBC was 2900 BC to 1800 BC with expansion eastward around 2400 BC. Dates of 2400 to 2350 BC (please check the translation to Ussher) seem a bit early to match up with about 1960 BC to 1700 BC. 5) Also, it appears from the maps that some of the BBC finds were located under the Glaciers that existed from before 1900 BC to 1490 BC. If so, then those finds would have to represent either sites before or after the Glaciers were present. However, one would have to double check on the find locations to be sure if this is even a real consideration. Because of 4 and 5 above, I had favored the earlier dates. Since you know far more about these concepts, I am sure you can fit what appears to be known (the 10+ items) about BBC within Ussher's timeline. I find that almost all Archaeological headlines and research has been build on Evolutionary assumptions and takes the few more factual information we have and tries to fit them into Evolutionary assumptions by sweeping generalizations, Inferences, and pure speculation. Inferences and Speculation are good and we must used these tools also, but we must always differentiate between them and more factual information – and it is good to be aware of all Inferences and speculation (it helps us) but we certainly should not to take them too seriously. Even the most factual information we find in these Archaeological papers is based on an array of evolutionary assumptions. 4A) analysed the genomes of 19 Beaker individuals across Britain and found that they shared little similarity with those of 35 Neolithic farmers there. The pot-makers were more closely related to 14 individuals from the Netherlands, and had lighter-coloured skin and eyes than the people they replaced. [dkw – lighter coloured skin and eyes - suggest that the beaker group was likely not of Phoenician background. Based on John's research, the Phoenician would have darker skin.] [dkw – if the time is right 1935 BC our time, then England's peoples may have been replace the peoples from colonies in France or Netherlands – fair skinned and lighter eyes]. Inference: that almost wholly replaced the island’s earlier inhabitants [dkw an inference from lack of data – a hypothesis, but weak.] Roberts says he doesn’t see evidence for such a huge shift in the archaeological record. The rise of cremation in Bronze Age Britain could have biased the finding, he cautions, because it might have eliminated bones that could have been sampled for DNA. Note: Inferences are not facts, but desire consideration. 6) The distinctive pots, possibly used as drinking vessels, are nearly ubiquitous; flint arrowheads, copper daggers and stone wrist guards are common, too. But there are regional differences in ceramics and burial style [dkw – suggests Trade with different people groups]. see distribution on above link. Picture doesn't load here. Speculation: They say the rapid expansion of the Bell Beaker culture, which is believed to have been instrumental in building the monoliths at Stonehedge, could hold the key. [dkw this contradicts previous article – now BBC built monoliths not Neolithic.] …. to eastern England, where it may have been responsible for erecting some of the megaliths at Stonehenge. Mixed Data: Corded Ware Peoples: and likely mixed Time Periods also. 7) The map of H1 and H3 Haplogroups corresponds well with maps of the Monolithic and Beaker Bell Cutures. Also particularly well with the Phoenicians. Inference now = Fact: 'We have established that the genetic foundations for modern Europe were only established in the Mid-Neolithic, after this major genetic transition around 4000 years ago,' says Dr Haak. Two fresh studies — one of ancient human DNA, the other a newly constructed genealogical ‘tree’ of languages — point to the steppes of Ukraine and Russia as the origin of this major language family, rekindling a long-standing debate. This ‘Anatolian hypothesis’ is supported by well-documented migrations into Europe, where agriculturalists replaced or interbred with the existing hunter-gatherers. DNA recovered from steppe herders called the Yamnaya, who lived in what are now Russia and Ukraine around 5,000 years ago, closely matched that of 4,500-year-old individuals from present-day Germany, who were part of a group known as the Corded Ware culture that encompassed most of northern Europe. Yamnaya ancestry survives in the genomes of modern Europeans, with northerners such as Norwegians, Scots and Lithuanians maintaining the strongest link. In our grand synthesis we argue that Yamnaya migrants were predominantly males, who married women who came from neighbouring Stone Age farming societies” These Stone Age Neolithic societies were based on large farming communities reflected in their collective burial ritual often in big stone chambers, so called megaliths. Very different from the traditions of the incoming migrants. The Yamnaya people originated on the Caspian steppes where they lived as pastoralists and herders, using wagons as mobile homes. From burial pits archaeologists have found extensive use of thick plant mats and felt covers. “In our big Bronze Age study, published in 2015 we were astonished to see how strong and fast the genetic changeover was from the Neolithic to the Corded Ware. There was a heavy reduction of Neolithic DNA in temperate Europe, and a dramatic increase of the new Yamnaya genomic component that was only marginally present in Europe prior to 3000 BC. Moreover, the apparent abruptness with which this change occurred indicates that it was a large-scale migration event, rather than a slow periodic inflow of people“. 9) Therefore it was possible to conclude that the Neolithic people were not speaking an Indo-European language, as did the Yamnaya migrants. • Also known as the Battle Axe culture or Single Grave culture. • Associated with the diffusion of Proto-Germanic and Proto-Balto-Slavic speakers. • Blend of cultural elements of the earlier Funnelbeaker culture in the North European Plain with the PIE steppe culture (Yamna). • Mobile pastoral economy relying mostly on cattle and occasional cereal cultivation. • Regular use of horses and oxe-drawn wagons. Presence of copper and bronze artefacts as well as stone battle-axes. • Coarse pottery typically decorated with twisted cord impressions, and sometimes with other types of impressions or incisions. Use of beakers and cups for drinking. • The dead were inhumed in flat graves inside a small mound. Bodies were laid on their side with bent knees. Wagons/carts and sacrificed animals were present in graves. The Proto-Celto-Germanic branch of R1b (L11) settled around Bohemia and eastern Germany circa 2800 BCE and established the Unetice culture, the Bronze Age culture which would expand across all Western Europe and Scandinavia over the next millennium, and replace the Neolithic/Chalcolithic Bell Beaker culture. for animation above see the wikipedia reference above and look for it. 1B, 2B) Beakers arrived in Britain around 2500 BC, declined in use around 2200–2100 BC with the emergence of food vessels and cinerary urns and finally fell out of use around 1700 BC (Needham 1996). 4B) The earliest British beakers were similar to those from the Rhine (Needham 2005), but later styles are most similar to those from Ireland (Case 1993). In Britain, domestic assemblages from this period are very rare, making it hard to draw conclusions about many aspects of society. Most British beakers come from funerary contexts. [dkw – Netherlands connection]. 10A) Britain’s only unique export in this period is thought to be tin. It was probably gathered in streams in Cornwall and Devon as cassiterite pebbles and traded in this raw, unrefined state. It was used to turn copper into bronze from around 2200 BC and widely traded throughout Britain and into Ireland. Other possible European sources of tin are located in Brittany and Iberia, but it is not thought they were exploited so early as these areas did not have Bronze until after it was well established in Britain and Ireland. The most famous site in Britain from this period is Stonehenge, which had its Neolithic form elaborated extensively. Many barrows surround it and an unusual number of 'rich' burials can be found nearby, such as the Amesbury Archer. Another site of particular interest is Ferriby on the Humber estuary, where western Europe’s oldest plank built boat was recovered. 11) Archer lived during Bell Beaker time period: The Archer's grave yielded the greatest number of artefacts ever found in a Bronze Age burial in Britain. Among those discovered were: five funerary pots of the type associated with the Beaker culture; three tiny copper knives; sixteen barbed flint arrowheads; a kit of flint-knapping and metalworking tools, including cushion stones that functioned as a kind of portable anvil and that suggest he was a coppersmith; and some boar's tusks. On his forearm was a black stone wrist-guard. A similar red wrist-guard was by his knees. With the second wrist-guard was a shale belt ring and a pair of gold hair ornaments, the earliest gold objects ever found in England. Tim Darvill regards the skeleton as possibly that of a pilgrim to Stonehenge to draw on the 'healing properties' of the bluestones. The southern R1b branch had advanced from the Hungarian plain to Bohemia and Germany by 2500 BCE (presence of R1b confirmed by Lee at al. 2012), and continued its migration until the Atlantic coast, reaching Britain and western France by 2,200 BCE and Ireland by 2,000 BCE. It is likely that these Proto-Celts who invaded the British Isles belonged to a great majority to the L21 subclade of R1b, as this haplogroup now makes up over two thirds of paternal lineages in Wales, Ireland and Highland Scotland. In fact, Cassidy et al. (2015) tested the genomes of three Bronze Age individuals from Rathlin Island in Ireland dating from between 1550 and 2000 BCE, and found out that they all belonged to R1b-L21 and were almost genetically indistinguishable from the genomes from the Unetice culture in Central Europe at the same period, confirming that a migration from central Europe to Ireland had brought R1b-L21 by 2,000 BCE. 13) In contrast, Cassidy's team found that the genomes of the Neolithic inhabitants of Ireland were almost identical to those of other Neolithic farmers in Europe and did not carry Steppe ancestry. 14) It is doubtful that the Bell Beaker culture (2800-1900 BCE) in Western Europe was already Indo-European because its attributes are in perfect continuity with the native Megalithic cultures. The Beaker phenomenon started during the Late Neolithic and Early Chalcolithic in Portugal and propagated to the north-east towards Germany. During the same period Bronze Age Steppe cultures spread from Germany in the opposite direction towards Iberia, France and Britain, progressively bringing R1b lineages into the Bell Beaker territory. 3F) It is more likely that the beakers and horses found across Western Europe during that period were the result of trade with neighbouring Indo-European cultures, including the first wave of R1b into Central Europe. Speculation: It is equally possible that the Beaker people were R1b merchants or explorers who traveled across Western Europe and brought back tales of riches poorly defended by Stone Age people waiting to be to be conquered. This would have prompted a full-scale Indo-European (R1b) invasion from about 2500 BCE in Germany, reaching the Atlantic (north of the Pyrenees at least) around 2200 BCE. Using isotope tests that look for molecular variations in teeth that are due to an individual's diet, researchers have found that between 28 percent and 42 percent of the women in the graves spent their childhoods following a grain-rich agricultural diet — "bread and muesli," Kristiansen said. In 1994 John Morris of ICR wrote a book on the Age of the Earth called "The Young Earth". In it he explains (pages 64-67) how the amount of C14 built up from near zero (basic creationist theory). This is where the concept of expotential rather than linear conversion comes from. It Must be somewhere on the Icr sites. If you search you will probably find it. As stated in prev. letter - most dates you work with from 2200 BC to 1760 BC should translate adequately in linear form - so use your Chart-tables. I can't find the "Bronze age " date for Rathlin Island right now but I think it was of the order of 1534-2028 cal BC. There is something obviously wrong with this conventional date that complecates things. I have to say again that the Battle of Magithe was in 2025 BCand that Partholan wasthe first person to colonise Ireland in 2035 BC (Ussher timeline) the 2028 date calibrated is nearly the same as 2025 BC with 3 yrs diffrence. I have tosay that this idea is nonsense as Partholan was the first to colonise. Seems like the 2200 conventional date covers Nemed and Britain Mael. There is ownly 440 years diffrence between 2200 and 1760 BC;Thus Nemed was 1725 BC and Britain Mail 1755 BC 5 years less than 1760 BC to be exact. Perhaps the 1760 carbon date is a bit offfor Nemed and Britain Mail I don't know. I went to the attic and found my old file folder on Egyptian chronology. The RC dates noted and adjusted to Ussherian suggest it would take a lot of time to resolve. I found an attempt I made at a conversion RC14 to Ussherian that I attempted - don't even know if it is accurate. It had Ussher 2200 BC as about 3000 BC RC14, Ussher 2100 BC as 2700 BC RC14, Ussher 2000 BC as 2440 BC, and Ussher 1900 BC as RC14 2200 BC. Then a note: Great Pyramid - Ussher 1925 to 1905 BC construction. No RC14 date (it is stone) but Egyptian Chronology suggests Great Pyramid in 2600 BC. But most old kingdom RC14 dates are thrown out since they don't fit Secular chronology, so 2600 BC is not a RC14 date. This is all I can do for now, hope it helps. My next email will explain why I am to over loaded to help with your project at this time. Been think and think the chart I found was a crude first attempt. should have use 3200 BC rather than 3000 BC to match 2200 BC - but some Egyptian Chronologist use 3000 BC as founding of Egypt other 3200 BC and some even 3300 BC. But these estimates by Seculars are seldom based on RC14 but linear chronology via Manetho. That's absolutely fine Darrell, By the way 3300 BC is for the building of Babel 2234/2235BC. Interestingly Ootzy the iceman also overlaps and is contemporary with this date. Interesting you should say linear chronology via manetho, Perhaps that is what mine is although maybe I don't know it. Appreciate your work and find it interesting. Trying to fit arch. digs and sites with the Ussherian and Historical Records is indeed an interesting concept and a challenge. This Fall I added to much to my research project (which does involve the study of how time functions). I do not know when my schedule will be back to normal, but it will be many months at least. I know I must cut things out now. During that time You should not expect any replies from me. If I get duplicate emails sent to me, I will just stop reading all. Not that I am not interested, I just that I can't handle it right now. By linear here I might rather than overlapping dynasties as in my chronology chart. Speculation is always a good first step to finding fits. If an early BBC existed in Ireland, which I don't concede, the it could have been some of the victors who move into S. England and via land bridge at time, possible south eastern Ireland as a remote possibility, but not as real colonizers. >>>>>>>>>>>> flood of Noah is concerned I stick with the date 1656 annomundi or 2348 BC. >>>>>>>>>>>> Exodus ca 1491 BC where there was a rappid Ice age catastrophic melt down. >>>>>>>>>>>> conundrem that refuses to go away and needs some answers. >>>>>>>>>>>> uses his own preconceived ideas. >>>>>>>>>>>> of the post flood ice age which lasted 700 yre. >>>>>>>>>>>> would include Britain from 2242 BC to 1121 BC who had no written records. >>>>>>>>>>>> This would date the Palaeolithic industries on the revised calander. >>>>>>>>>>>> b/ The Neolithic/Copper Industry. >>>>>>>>>>>> and the Egyptian Herculese one and the same person? >>>>>>>>>>>> more questions need answers Emmet. >>>>>>>>>>>> the Neolithic people have built Stonehenge say 1013 BC? >>>>>>>>>>>> and iron ages correct ? Just got back from Crete. Yes, you can put anything of mine you want on your website. Stonehenge I believe was built a little later, probably between 800 and 750 BC. debacle outside Jerusalem probably occurred around 477 BC. show in my website article "Venus of the Flood, Mars of the Exodus,"
850 BC, was caused by Mars, not by Venus, as Velikovsky believed. massive earthquake activity continued till around 750 BC. Dear Emmet many thanks for this very interesting email. It certainly goes to resolve some of these perplexing conindrems and at somepoint we could establish maybe a discussion forum but let me say many thanks for your kindness in allowing me to show some of your material on my website. Dear Emmet for my research purposes I need to strictly with the greatest respect stick with Ussher's Biblical Chronology. As far as the flood of Noah is concerned I stick with the date 1656 annomundi or 2348 BC. This must not be confused with the Venus catastrophe of the Exodus ca 1491 BC where there was a rappid Ice age catastrophic melt down. According to my and Darrell White's timeline there was a flyby of an ice plannet that dumped it's astrolor celestial ice over the North and South poles at the time of the Babel despersion in 2191 BC and Babel founded in 2234 BC. There was indeed another flyby in 1491 BC by the same plannet assuming it to be Venus according to Velekovskey and indeed the catastrophic end of the post flood ice age where the landbridge of the North Sea and English channel were broken. Thus what happend in the year 23 March 687 BC where I think Velekovskey refurs to this as the final catastrophe of the ice age and the landbridge is finally broken in 687 BC this is the biggest conundrem that refuses to go away and needs some answers. Exodus and also the final sinking of the Atlantis island). agriculture - thoug most settled communities were fishing communities. as far as Malta, where their monuments can still be seen. carved the granite and diorite statues of the Fourth Egyptian Dynasty.